Answers to our customers most frequently asked questions. At Sylvan Brandt we offer our customers the perfect beauty of imperfection. Through careful inspection and quality control, we produce the best boards and flooring that antique and salvage wood offer. To cut down on waste and keep our prices as low as possible, you may find that we do not offer the same options that you might find elsewhere. We value the natural beauty of the beams and boards we use, and our flooring graces hundreds of well-appointed homes nationwide. Below is a list of FAQs. If you have a question that is not addressed here, please feel free to call or email us. We are happy to help. Our mill, showroom and Antiques Loft is open Monday through Saturday from 8:00 am until 4:00 pm. Can you suggest someone to do the installation? How should the Reclaimed and/or Weatherboard Flooring be finished? Both our Weatherboard and Reclaimed Attic flooring have untouched, original surfaces. When installed it should be sanded very lightly with a vibrating or hand-sander using a fine-grit sandpaper. Sand the surface just enough to remove any splinters or dirt that may still be on the boards. When sanding is complete, we suggest three coats of clear satin Polyurethane (oil-based), buffing the floor between each coat for beauty and maximum durability. If your Weatherboard Flooring has been touch planned, follow the instructions above, however, you may choose to use a stain before the polyurethane. The above instructions are simply suggestions for installing your Sylvan Brandt floor. Feel free to experiment with your flooring installer to find a finish that suits you best. *Note that if you use a drum sander on Weatherboard or Reclaimed flooring, it will strip the patina off the boards. How should the Resawn Flooring be finished? Our Resawn Antique flooring is milled from antique beams so each board is planed on both sides. These floors are to be installed similarly to many other hardwood floors. They will need sanding with a drum sander, stained based on personal preference, and then sealed with three coats of clear satin Polyurethane (oil based), buffing the floor between each coat. The above instructions are simply suggestions for installing your Sylvan Brandt floor. Feel free to experiment with your flooring installer to find the finish that suits you best. What is face nailing and should we use it? For boards that are 5″ or narrower, there is no need to face nail. Tongue nailing the boards while installing them is sufficient. For boards 6″ AND wider, you want to either glue the boards, screw them down, or face nail. Here at Sylvan Brandt we think face nailing is a beautiful, authentic look for your antique flooring and provides added stability to the wider width boards. We have beautiful reproduction nails available from Tremont Nails. Square cut masonry nails also work wonderfully and can be found at most hardware stores. Please contact us for more information about Tremont Nails. Face nailing is best applied by creating a nail pattern 16-32″ apart on top of the sub-floor. All flooring boards should start and end on the nail lines in order to firmly secure the ends of the boards. It is also best to pre-drill the nail holes. Feel free to call for more detailed instructions. Can I get all one width? All one length? In most cases, our floorboards are random width. We produce flooring from antique beams and boards and it is difficult to produce boards that are all the same width or length because of quality control. Sometimes we are able to accommodate customers who are looking for a narrow, one-width floor. This depends on the type of flooring you are interested in. Is all your material reclaimed? We take pride in selecting the finest, reclaimed material available to produce our flooring. 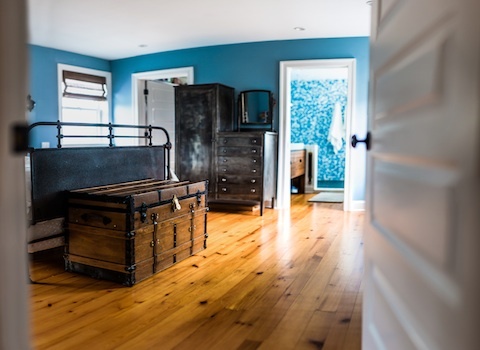 All material is salvaged, reclaimed lumber that was cut and used as building material at least one hundred years ago that is available to be rescued from demolition and recycled for modern day use. Fresh-cut or recently cut tree wood is not used in any of our products, nor is it purchased from our vendors. Not only do we offer 100% recycled, eco-friendly material, but the beauty and stability of antique wood material cannot be found in today’s fresh cut lumber. Please feel free to contact us with any other questions or concerns. Do you grade your floors? Here at Sylvan Brandt we do not grade our floors. We like to simplify the buying process for our customers. Many companies tend to grade their floors differently and therefore price differently. We sell high-quality flooring and provide pictures and samples so that you know exactly what your flooring will look like once it is installed. Are the boards all the same color? The beauty of our antique flooring is in the varying tones and shades that the natural aging process has produced. We guarantee that each floor will be cohesively beautiful and showcase all that nature has to offer. If you want your floor to have a more consistent color, simply choose a darker stain during the finishing process. Do you make quarter sawn flooring? We will make quarter sawn flooring in Antique Heart Pine only, in narrow widths. Do you kiln dry your flooring? When barn wood is brought to our mill it is typically 12-16% moisture content. After sawing, the wood is placed in a drying room for anywhere from one-to-three weeks until the moisture content is reduced to 8-10%. Is your flooring end matched? We produce our floors to be installed as they were in the 1800’s – with face nails. End matching requires that the boards be shorter which decreases the aesthetic value. Face nailing assures the same stability of end-matching and provides a beautiful, historic quality. Does your flooring have stress relief on the back of the boards? We sell only antique, salvaged material which is extremely stable, acclimated, and dry. New tree wood requires stress relief because it is very unstable and may shrink and warp when it begins to dry out. Stress relief is simply unnecessary for our material. For questions regarding our return policy please contact us at genna@sylvanbrandt.com or 717-626-4520. Do you ship your flooring? Yes! We ship our flooring all over the country (and internationally too!) using the best possible estimate from several reliable and common carriers. Please call or email for a quote!